If you’ve ever studied the family tree of people who’ve either been in the Misfits over the years, or at least played in bands with former Misfits members, then you know there are more characters there than in the cast of most soap operas. After the original band dissolved in the 80s, singer Glenn Danzig went on to form Samhain, which evolved into Danzig, with a number of different people. Meanwhile, the Misfits were later reformed by bassist Jerry Only. Here again there was a rotating line-up of members, but one of the best-known was the foursome that put out a few albums in the late 90s, which included Only’s brother Doyle von Frankenstein (who I believe had also participated in the band’s earlier incarnation for a time) on guitar, a drummer named Dr. Chud and vocalist Michale Graves. All of those folks have left the band at various times, leaving the bassist once again as the sole original member (and now, as I understand it, also handling vocal duties himself). Von Frankenstein was last seen as a member of the Danzig Legacy tour, which also featured the titular singer. Graves and Chud had set out on their own prior to this, working together in a band called Graves, if I’m not mistaken. Then the two parted ways, playing in other bands, and eventually the singer embarked on a solo career, which finally brings us to the present day. 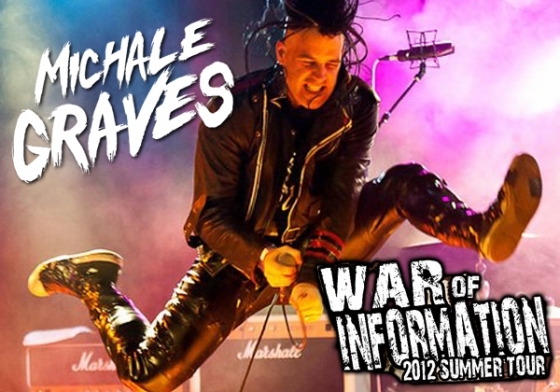 UPDATE – 18 September 2012 – click here to see the latest additions to the War of Information Tour dates!